Midway through Lent I decided it would be good idea to post my humble reflections on what this Lent meant to me and how I have learned from it. I decided the best time to do that was during Holy Week, so after much procrastination, I am writing this on Holy Saturday evening…essentially the last possible minute! From the above heading, it may seem that I am about to make a math class out of a Lenten conversation. That isn’t too far from the truth, because one of the main things we observe in Lent is subtraction. We take things out of our life in order to help us appreciate them more, help us understand our own weaknesses, and in the end of it all we hope to grow closer to God. We do this by saying “no” to worldly attractions and give our attention to Christ and his message. Well, that’s in an ideal world. Moving on, it is possibly slightly less common to see people add things to their life during Lent. Through addition, we add things to our life that are designed to bring us closer to God. The most basic example is spending more time in prayer. I for one made a special effort during this Lent to get to at least one extra Mass every week, usually Friday. I was also more strict about morning/evening prayer and tried to add in an extra rosary in during the week (to be honest in some weeks, 1 rosary is “extra”). The idea of addition in Lent is really just about spending more time in the presence of, or in conversation with, God. Next up; division. The classic division class involves a pie. Let’s start with that. We have any number of pies in our life: our finances, our belongings, our relationships, and our time. I think Lent is a great time to look at all those pies and see what parts of them that we can spare for others. You may not be able to give from one pie this lent, but there might be another pie that you can just about empty. For example, my belongings pie is currently very small, but my time pie is big. So, I made an effort, a poor one at that, to give more of my time to others. Boom! By adding more Christ to our lives, subtracting our wants, and dividing up the gifts we are given, we can multiply our Graces. No wonder they call me Baby Einstein…or is that just my crazy hair?! In theory, I clearly have this Lent thing down A++! In practice; however, I think I can realistically say that I barely passed. I don’t know about you, but as every Lent passes, I always feel like my own self inflicted subtractions, additions, and divisions become a little bit stale. Therefore, it is often nice to get an idea for something from an outside source. The pastor at the small parish I go to, Sts. John Fisher and Thomas More, would have small lines of the gospel of the day handed out to all the parishioners. He asked us to take these home with us and meditate upon them during the week. This provided me with a great addition from an outside source and I was more than willing to oblige. Below are some of the passages and my brief reflection. 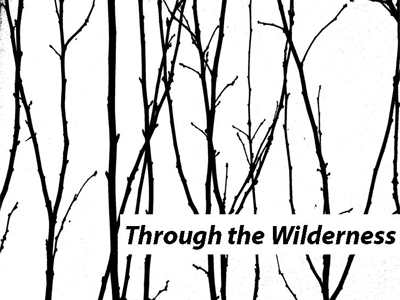 “Through the wilderness” – My meditations often end up, or begin as, pure daydreaming. So, when I first read this passage, I couldn’t help but think of being back in the woods as a young boy in Virginia romping around with my friends on a warm summer day. Upon more serious thought, I realized that “going through the wilderness” is a journey; ultimately a journey to Christ. However, being in the wilderness also entails the notion of being lost, or at least unaware of the way ahead. I thought to myself that this is true for everything in life, we are never sure what lies ahead in our journey. Personally, it made me think about my footballing journey in England. I’m not aware where it will lead, but I must be sure that it can bring me closer to Christ. “He did not know what he was saying” – I found this a really humbling passage, because it is so often the case for me (ie: this entire post). Some of the things we argue over, complain about, or believe are important are so often completely irrelevant to God. Yet, he remains patient and kind, while teaching us by word and example what is truly important. “And manure it” – so there is such a thing as “Holy Crap”! Alright borderline blasphemy, I’m sorry. In this passage, the manure is being used as a fertilizer for the fig tree that does not bear fruit (i think), which represents us. So, again, a somewhat humbling passage…we need to be manured when we don’t bear fruit. As a matter of fact, even when we are bearing fruit, we want to ask the gardener to heap even more manure on so we bear even more! I realized that the manure represents those things which we don’t necessarily want to do, but must do in order to become better, more Christlike people (ie: the subtractions, additions, divisions). Ultimately, we need to be manured in order to get to Heaven. 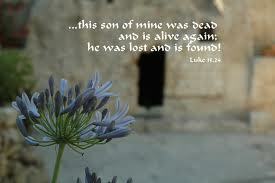 “He was lost and is found” – Boy o boy, how many times has this applied to us! Lost everyday me! God is always bestowing me with gifts and I am constantly throwing them away, only to come crawling back (aka: confession). This passage always makes me thankful that we have such a forgiving, providing, and loving God. Week 5 I went to Mass at a the Cathedral in Leeds and did not think to find my own phrase. This helped me realize how useless I am on my own. Week 6 was Palm Sunday and they did not hand them out. However, funnily enough, the part of the Gospel (of the Passion) I remember thinking about was when the Apostle cut off the servants ear. At first I was thinking how hard it would be to cut someone’s ear off without seriously harming the rest of their head. However, upon further reflection I decided that the message was that violence is not the answer to any injustice; even the taking of an innocent Jesus to trial and death. Well, that is my 6+ weeks of Lent jammed into a small post. 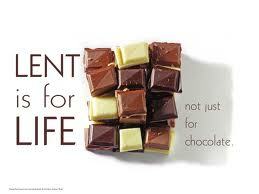 Overall, this Lent made me realize how useless I am without the help of God in my life. I must thank him for every little thing he gives me, and ask him to give me strength to fight evil and temptation, because on my own, I can’t even resist a piece of Chocolate…and that my friends is how I know how weak I am. One last reminder to you all. 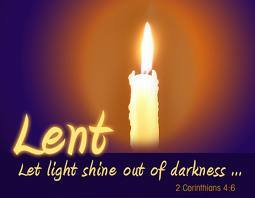 The Theory of Lenten Mathematics applies all year long, so add, subtract, and divide so you can multiply those Graces! I hope you all had a blessed lent. 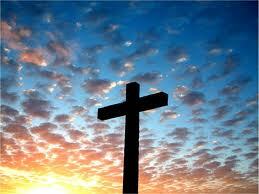 Peace in the resurrected Christ!